Do you want to have a USB Broadband Modem? 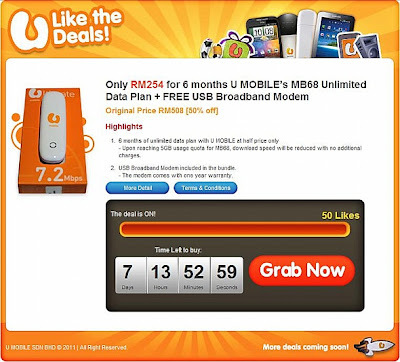 U Mobile is throwing a special promo for 1 week , offering its 7.2Mbps USB Broadband Modem with six months of MB68 unlimited data plan for only RM254. You will get to enjoy up to 5GB of data with the MB68 plan worth RM408 (RM68/month). Additionally, the price of the modem, according to the price on U Mobile’s page, is worth RM100, so you get to save 50% with this offer. This is a pretty good deal which calculates to only RM42.30/month. It easy to grab this offer. It is available on the telco’s Facebook page, all you have to do is “like” the deal. A couple of months ago, U Mobile also gave out a similar offer which allowed consumers to purchase the same USB modem along worth 30 days of internet access. Visit U Mobile’s Facebook Page for more details about the Like the Deals App offer. The deal is already active, so you have approximately 7 days left to sign up for it and purchase at any of the 10 different U Mobile Service Centers listed. Other fine prints includes: it’s a limited offer for the first 200 signup’s only, redemption period will start next year, and you can only purchase one deal.